Looking for a job in London’s tech sector? Want to hire talent for your digital creative company? Read what the London Economic Development Corporation is doing to further highlight open position in the sector. Really tall walls, climbing grooves, ropes and a whole lot of fun. 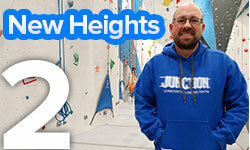 Welcome to Junction Climbing Centre. An initiative that was started just two years ago has arrived at a significant milestone and is bidding adieu to London on a high note. Copyright © 2014 London Economic Development Corporation, All rights reserved.